Does World of Warcraft sometimes scare you? Death and destruction is everywhere, but it takes a little extra for something to be creepy. I’ve compiled what I believe to be the 10 most creepy things in WoW. We’ll start out slow. 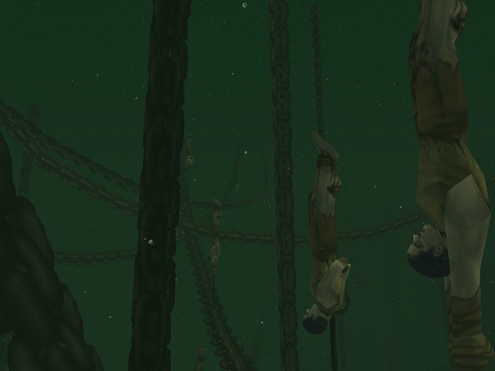 Everyone is probably familiar with the hanging corpses along the Scarlet Monastery pathway. If you dare take a closer look, you’ll see that these corpses are human and sometimes hung upside down, or have missing limbs. Hung corpses can be found elsewhere as well, fx at the entry into Deadwind Pass from the Duskwood side, where a couple are hanging as a warning of what’s to come. Creepy can sometimes be found in the detail. The picture above is depicting a gnoll tent, revealing what the fabric of their tents are really made from. A quick trip to Westfall where gnoll packs are common, can show you first hand where many of the lost people of Westfall met their demise. Now we know what becomes of the ones dying to Hogger! 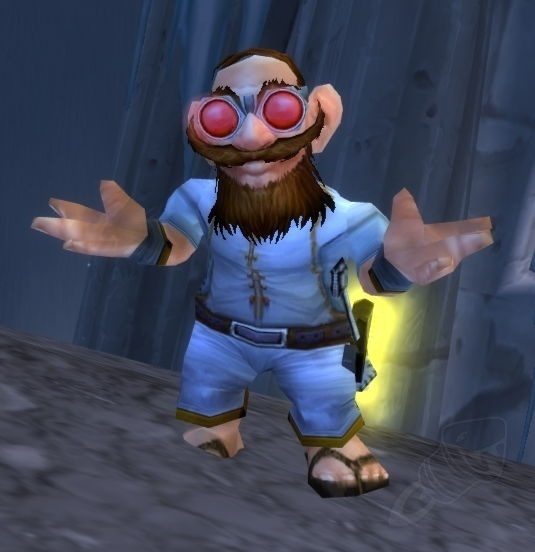 Doctor Weavil is an easily underestimated lvl 63 elite gnome on the prison island Alcaz. 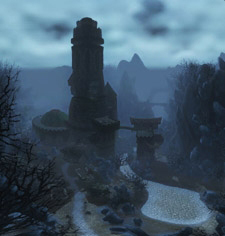 The island, has an underground prison, where the king of Stormwind, Varian Wrynn was kept captive. Alcaz Island mostly looks like a fortified jungle base, not to forget Dr Weavils flying machine. What’s spooky though, is not just Dr. Weavils countless minions, that all wear the exact same outfit and cats eye goggles, but that he is able to keep a player enslaved continously transformed into one of his minions. His next entry is about beating one of his minions till he “cries like a little girl”. Yeah, the guy’s got issues! Dr Weavil likes to nap, so you’ll find him upstairs in the biggest building on his bed. When engaged in combat, Weavil will start mind controlling the person with the most aggro. The mind control effect doubles the targets health and quadruples its damage dealt, making your mindcontrolled friend lethal to you. If you are the last man standing, he will add you to his minion menagerie and you are forced to stand by his side while he lays back down in bed, where he heals to full. For the two minute duration of the mind control, you can’t do anything, you can’t run, or even log out. You have a brief moment to change your fate when your mind control wears off to run away! He will chase you, and even stun you for 2 seconds, teleport you back up and continue his mental bedside slavery. This could potentially go on forever, which is why Dr Weavil is on this list. Your best chance is to run far enough away and hope you make it out. Another option is to try and commit suicide by having the other minions kill you. Unlike many other enemies, Dr Weavil wants you alive and alert, as a well-dressed zombie. – “I brought you a housewarming gift, Jarl. Go on, open it. I think you’ll like it. This is how the story begins. Mordant comes to visit his old friend and he has practically gone insane. The storyline has earned its place, because it’s set in Dustwallow marsh, which reminds me of the Manchac Swamp in New Orleans and the ending is rather creepy. First you’re asked by a neurotic Jarl to get him frog legs and other cooking ingredients. Later Mordient will ask you to aid him against the haunting of Witch Hill. If you’re doing the questline, you’ll notice how Jarl is obsessed with his sword. Perhaps you should rummage through the dirt pile near his house. The throne room on the upper tier of Undercity also known as the Ruins of Lordearon, was once the scene of a brutal murder. It was the Capital of the human kingdom, until the crown prince, Arthas, after becoming a deathknight, brutally killed his own father King Terenas Menethil II in this room. If you look closely, you can still see the blood trail, and the hear sounds from back then. If you turn the music slider down and ambience up, while keeping the volume high, you can hear the last words of King Terenas in the throne room, whispers in the courtyard, the ringing bells and a faint cheer from the citizens celebrating the return of the prodigal son, Arthas. After the murdering of his father, Arthas and the Scourge invaded the city, killing every citizen they found. To this day, the lost citizens of the old human capital are still haunting the courtyard. Using a way of detecting invisibility will enable you to see them. More hauntings can be found on Raven Hill graveyard in Duskwood. Besides Duskwood and graveyards being spooky locations in themselves, this graveyard hosts entities that have the appropiately unsettling name “Unseen”. It’s not clear what The Unseen are, due to their mysterious name, perhaps tainted spirits of the graveyard. They are neutral until attacked, but are level 49-51, making them deadly to ordinary players in this leveling zone, that aggress them using an aoe. Using a form of detecting invisibility will let you actually see the unseen. The above are the twisted whispers from the Old Gods Yogg-Saron and C’thun, that can drive you insane. Their repertoire, I should add, is bigger than that. 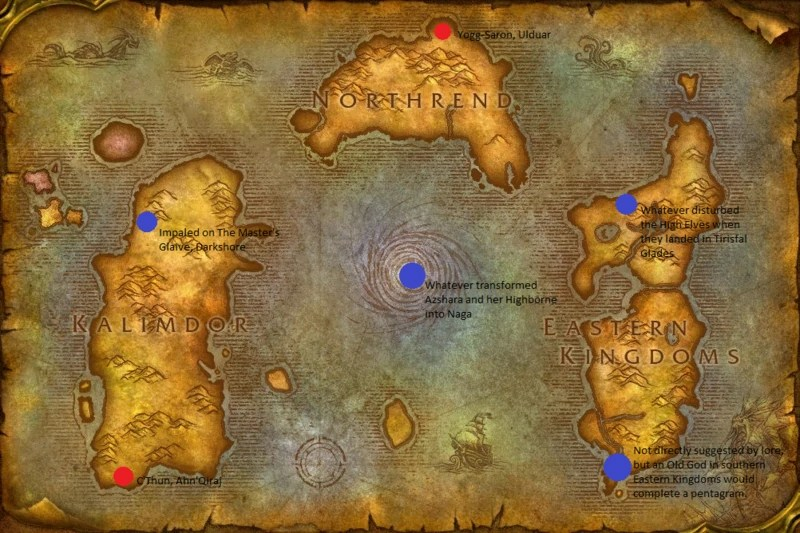 There’s only about 3-5 Old Gods (two known and a few suggested, click the map below), and due to their mysterious powers, the titans sealed them away during ancient times deep underground, where their mad whispers would be their only way of interfering with the world above. The Old Gods weren’t even known to Azerothians, as their malicious reigns were in a distant past, and they are still somewhat of a mystery in the lore, as their ancestry is obscured, but signs of their strong corrupting powers can still be traced way back throughout the history of Azeroth. The most recent encounters with Old Gods are C’thun and Yogg-Saron, both share many similarities, especially telepathic powers. In order to kill them, you must in some mode also kill them from the inside. Their physical forms look like submerged alien looking creatures with tentacles. Underneath is a rather wellcut video showing the grand fight against C’thun. Yogg-Saron, on the other hand, when fought – is a hectic fight where maintaining your sanity long enough to kill him is crucial. If you go insane during the fight, you will attempt to kill others while under his mindcontrol, thus fulfilling his evil prophecies of betraying your friends! Yogg-Saron aka “The Lucid Dream” will during the fight induce illusions where you are facing dilemmas of killing friendly npc’s, that are just images created by Yogg-Saron to make you fail. Queen Azshara, whom we will face in Cataclysm, made a pact with a dark mysterious voice as her and the her highelves were being sucked into the Maelstrom. They were saved from drowning, but in return transformed into Naga. There’s a good chance the naga are worshipping this unnamed Old God. We are yet to find out! If you’ve been to Naxxramas, you must have heard the desperate cries for help echoing throughout all of the lower part of Naxxramas. Some find the voices to sound like children, but to me it sounds like a woman crying for help. Remember though that these are not people to save from torture, as it is already too late for them. I didn’t know this, but apparently Thaddius is “built from the flesh of women and children, it is said that their souls are fused together – eternally bound within that foul prison of flesh.” Commander Eligor Dawnbringer says. Thaddius reside in the Construction Quarter, where you can also meet the other abomination bosses, all are living dead Frankenstein-esque monsters. And it turns out Thaddius is one creepy creation. Thaddius’ voice which can also be heard from the youtube clip above, sounds like it’s consisting of several lighter and a darker voices, reflecting his messed up synthesis of several victims. As a twist, Thaddius thanks you for killing him, perhaps it’s the merged souls of his parts, that can finally break free. At least the screams have been said to stop after Thaddius is slain. Goldshire – isn’t that the home of the more silly part of the WoW population? I know Goldshire can be creepy at times, especually when fully populated, but did you then know about the diabolical kids of Goldshire? If you go to the skinning and leatherworking trainer house and go upstairs, there’s a good chance the Goldshire kids will be standing in the bedroom, immobile and forming a pentagram. It’s at this point you turn your volume up. There’s no official story tied to them them, which make speculations run wild. They all have 42 life and are said to change the direction they are facing and to wander off to stand in front of Stormwind and Northshire, still forming a pentagram. If you stand in the bedroom long enough, you will hear C’thuns whispering. Remember though – the whispers of Old Gods can drive you mad! This is in my opinion the scariest place in Azeroth. It’s not accessible by normal means, perhaps due to it’s interior obscurity. The Karazhan Crypt is located at the graveyard affiliated with Karazhan, named Morgan’s Plot, which is also the burial site for no less than Aegwynn and Medivh. Opposite the church, you can see the graveyard. This is where the entrance to the crypt is, sealed off by a gate, preventing anyone from entering, or escaping for that matter. 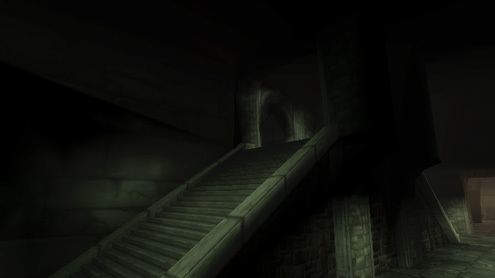 The inside of the crypt consist of several rooms, each with their own name and uneasy theme. Since the crypt is blocked to unexploitative venture, I have attempted to bring you the best pictures I could find. The most dreadful of all the rooms is named “The Upside Down Sinners”, which is filled with water and scattered corpses hanging tied in chains head down, some by their feet, others by the neck. Notice how detailed they are, compaired to fx the hung corpses around Scarlet Monastery. Rumours say their eyes move. The game music down there is a ghostly chant and a faint, but repetitive heartbeat. Perhaps trying to mimic your own heart, or.. that of “others”. The picture to the right is from the “Well of the Forgotten”, notice the scratch marks. 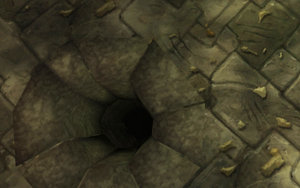 It features a hole in the floor, which leads down to “The Pit of Criminals”, which is shown below. You get the idea, that the hole was used as a dump for the bodily remnants of what we can assume were outlaws. 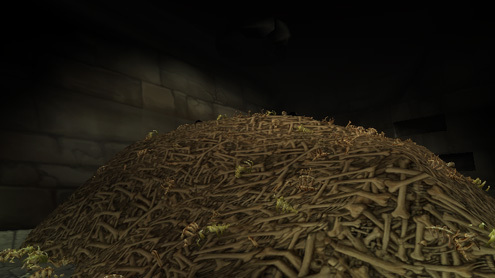 A black staircase is situated behind the pile of bones, leading up to another tier. The next picture shows “The Paupers Walk”, a spiralling incline dented with “inhabited” tombs on the sides. 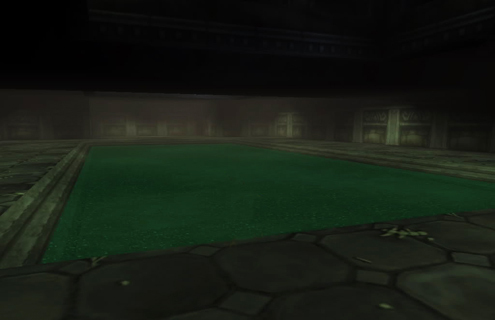 This is the “Tome of the Unrepentant”, the chamber with the heartbeat, with a shallow pool of greenish water in the centre and an open square in the ceiling. The room pictured below has low ceiling height and a soil base, giving rise to the thought that this possibly could be a mass grave. The alcoves on either side are gated and can be opened into a smaller room with a stone grave set in the floor. Not having entered the crypt myself, I can’t say for sure just how big it really is, but judging from the pictures and videos others have put up, it looks massive. 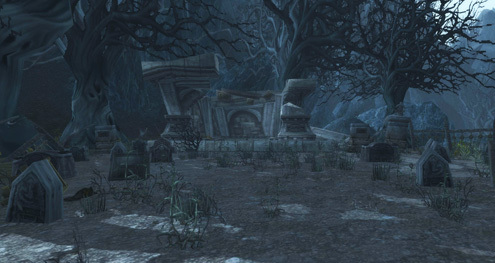 Word of the street has it that the crypt stretches all the way under the Tranquil Gardens Cemetery in eastern Duskwood. The rooms are generally large but mostly empty, besides various stone tombs and different skeletal remains. Whilst there are no apparent apparitions you’ll run into, the crypt atmosphere and soundtrack is yet very haunting. No one knows exactly what the purpose of it is, although there are rumours about Karazhan having an underground replica of itself, holding much more powerful creatures. This fits with the Upside Down Sinners room, although they are also said to be a reference to a movie. So far we will have to let it rest as a mystery. Below is a video from Karazhan Crypts, the music is authentic for the place. And by the way – sleep tight tonight. The crypt is located at the graveyard affiliated with Karazhan, named Morgan’s Plot, which is also the burial site for no less than Aegwynn and Medivh. Inside the wrecked church, you’ll find two unliving residents, and one patrolling on the outside. The church however is not the true horror of this location. Opposite the church, you can see the graveyard. This is where the entrance to the crypt is, sealed off by a gate, preventing anyone from entering, or escaping for that matter. The inside of the crypt consist of several rooms, each with their own name and uneasy theme. The most dreadful of all the rooms is named “The Upside Down Sinners”, which is filled with water and scattered corpses hanging tied in chains head down, some by their feet, others by the neck. Notice how detailed they are, rumours say their eyes move. Not having entered the crypt myself, I can’t say for sure just how big it really is, but judging from the pictures others have put up, it looks massive. 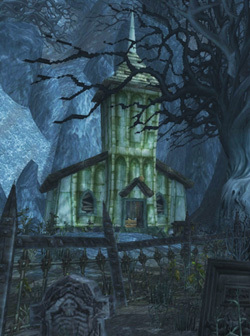 Word of the street has it that the crypt stretches all the way under the Tranquil Gardens Cemetery in eastern Duskwood. The rooms are generally large but mostly empty, besides various stone tombs and different sceletal remains. Whilst there are no apparent apparitions, the crypt atmosphere and soundtrack is suitable haunting. Another underground place near Karazhan, and at the same time an accessable one, is named “The Master’s Cellar“. 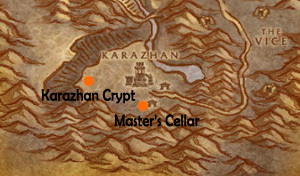 The infamous Karazhan Crypt is located to the west of Karazhan castle. 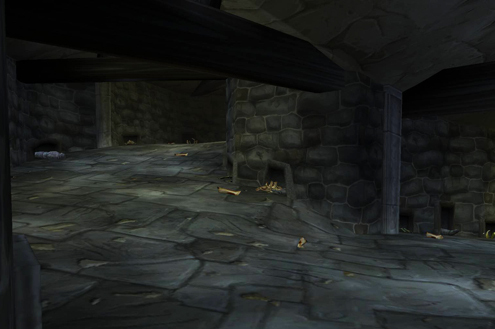 The Master’s Cellar is part of the small consorting village that graces the entry part of Karazhan itself. The cellar is part of a now burnt down house, revealing the hatch in the floor. It’s quite big for someone who was likely to have worked as a servant, but judging from the name, this might have been externally connected to Karazhan. It contains several rooms with many barrels, broken carts and a well in a corner. In the middle of the center room, a shallow pool can be seen, much like the one in the Tomb of the Unrepentant, although smaller. While ignoring the various kinds of ghosts (lvl 68-70) trampling the cellar, you can get an idea of this being a winery, with the center pool being used for pressing grapes. Another interesting feature of the Master’s Cellar is the huge wine rack-wall, which is depicted below. Despite the obvious access, none of the ghosts down there appear drunk. I changed blog template from black to white background a while back and never got around to changing the text colours. Fantastic list! I never noticed the gnolls’ tents before, that one messed me up. I love lists that focus on the creepy aspect of WoW, and seeing Kara always gives me a haunting feeling no matter how many times I see it. Great job! the children in goldshire are standing in a mis-shaped pentagon, just like the map above, and after a while c’thun whispers, they aren’t purposely standing in a pentagon, they’re purposely standing in the spot of the old gods on the map. This entry was posted on September 15, 2010 by Ironyca in Exploration Finds, Recounting Azeroth and tagged Creepy Things, Tour of WoW, World of Warcraft.